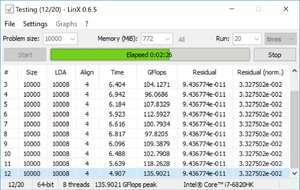 LinX is designed to be a simple interface for Intel Linpack Benchmark. It checks stability of the system and can detect hardware errors. The main point of Linpack is to solve systems of linear equations. It is designed as a benchmark to test the performance of a system in GFlops - billions of floating point operation per second. Version 0.6.5 is a freeware program which does not have restrictions and it's free so it doesn't cost anything. For security reasons, you should also check out the LinX download at LO4D.com which includes virus and malware tests. Additional screenshots of this application download may be available, too.